The state highway leading out of Bengaluru crisscrossed through narrow busy city streets. It was about six on a sleepy Saturday morning. It is generally considered taboo among the Bangalore techie crowd to wake up this early in the morning. If one did wake up, it was considered even more odd to drive a car rather than go for a brisk walk, sucking up all the unsettled dust from last night’s traffic into your lungs. I was driving alone and still within Bangalore limits. A highway, road, street or a cut between two buildings are all considered the same in my beloved crowded city. Can’t complain as the flow of immigrants into the city is the highest, possibly next only to Mumbai and Delhi. Even people from these two major cities emigrate to Bengaluru. Such is the power of the city that offers diverse employment, good weather and a chance for people to lead a better life in the future while suffering in the present. It is better than their past and that is all that matters. There is a certain happiness in the heart that comes from doing things that you can only dream of doing on a regular day. Driving with only a few vehicles alongside you is a privilege. When you do so while crossing the infamous barrier called ‘Silk Board junction”, the heart bursts full with pride. I still used my Google navigator so that I didn’t miss the directions for taking the service road that cuts towards Hosur. These service roads tend to be tricky business. You never know you are on one until the Google navigator lady lets you know so in her crisp American accent. She has singlehandedly helped in giving a lot of respect to the road construction talent of BBMP’s contractors. I was supposed to meet my guide at a spot before the flyover began. My guide and I didn’t exchange much information prior except for calling each other and talking in Telugu. We were meeting for the first time. I described my car and he described his dress. He identified me first. The young chap hopped next to me and we were soon on our way atop the flyover. Everyone overtook everyone on this stretch of the road. It catches on like the flu. Even I was overtaking a few vehicles in front only to end up charging their competitive spirit as they started showcasing their hunger for speed. I only had a Hyundai i10, a humble car that gave up before me on competing at such levels. The battle was one-sided. The highway cut across a few more roadways as it chugged along towards Anekal. I knew I exited Bangalore as the roads got better. It felt like I was actually driving a car for a change. We had already cut through a turn and were on the highway that took us towards a few village roads. This was no scenic ride. There was nothing much to see except for a few people lazily brushing their teeth in the open. I was headed towards Tamil Nadu. A village over there to be precise near a town, Thally. Thally is interestingly called as the Scotland of the East. Nobody knew who gave this title except for the person who put it out there in Wikipedia. On checking later with a few locals, it came to my understanding that this place is colder than Bangalore. There could be a better story, but I wasn’t too interested in it. Thally isn’t too far from Bangalore, but is on the other side of the border in Tamil Nadu. A huge lake welcomes visitors to this town. Massive banyan trees dot the landscape on both sides as my guide asked me to take a right turn and then cut through a smaller highway headed towards Jigani. The air-conditioning in the car was switched off. Normally, I turn it on as I roll up the windows while driving in traffic. But, this leads to suffocation and hence the air-conditioner. The air was much fresher and had the rural smell of cow dung and earth. Curious onlookers fixed their gaze on me. In villages, many people sit on the side of the roads doing nothing. They wear clean white clothes with a colorful towel on their shoulders. They keenly watch the happenings of the day. A few board crowded buses headed towards the major towns. The locals were used to strangers buzzing along in their vehicles on the Jigani stretch. They still wanted to make sure they knew who was passing through their village. Rose farms with beautiful pink hues could be seen to my left. They are sold to markets in Bangalore, my guide said. A few kilometers further on a peaceful highway, he led me to a sharp turn on the road. I thought I was about to ram into a house nearby. It was a village road. I just had to keep driving. I braked hard as a young kid crossed my path. The guide asked me to just keep driving. The kid didn’t care much either. He just knew when to pace his steps faster. Further ahead, a goat was lying in the middle of the road. On both sides were houses and the gazes of curious onlookers increased. I wasn’t comfortable with the attention. But, the people were friendly. They called out to the goat and it reluctantly gave way to me. I thanked them in English. They stared back at me in amusement. As I crossed the row of houses, the car began to wobble more and more. The village road ended after a two hundred-meter stretch from the main road. It was now technically a pathway that kind of existed there. My guide just asked me to keep driving along. I was worried about the tires as rocks kept getting crushed under the car. An old man was walking his cattle in front and had the right of way. The guide honked on my behalf. The old man signaled the cows to step aside. Cows and human beings were at their laziest best. In the village, nobody was in a hurry. The people knew there was another day coming up tomorrow. As we drove along, the guide asked me to take one more turn towards the right. “Where to?” I asked, confused. I just followed his lead. Lo and behold, there was indeed a small pathway that cut to the right. You could never see it unless you knew it existed there and turned. I was excited. This road was so narrow, it could accommodate just my car. I asked my guide what if another vehicle came from the other side. We would be stuck. Such panic attacks happen to the average Bangalore driver. He looked at me with a bewildered smirk on his face. He smiled. I agreed. It then struck us both on the significance of the statement he just made. He immediately took the first initiative. My guide wanted to go on. But, I signaled to him that whatever he said made sense. He wanted to feel always appreciated. He talked about his own village and how he left farming to take up this real estate job for supporting his family. “Sir, there is no money in farming. We find better jobs to do mostly in the cities. Helps us keep going. What do you wish to do sir?”, he asked. We rolled a few yards, hit a big sharp rock right in the middle of the road, climbed over it somehow and then stopped. We don’t park in village roads. We just stop on the road. People are patient enough to wait in case you block their path. This was unlike in Bangalore where usage of crude vocabulary is the norm to resolve such issues. My guide showed me a plot of land. It was dry and the soil was a rusty red. In a corner of the land, my eyes caught sight of an ant hill. There wasn’t much to see in a barren piece of land. However, I stepped down a slope and walked. It was exciting to walk barefoot on mud. “Are there any snakes or other insects that can bite you?” I asked my guide. “Why not sir? You will certainly find them here”, he said. He didn’t get the intent of my question. I put back my slippers and started walking. “Now, what about water?” The adjoining lands seemed to have borewells, but this land had just dirt and nothing else. A mango farm opposite the land looked healthy. The leaves were dark green and young fruits were hanging down the ends. “Water you will get sir. You have to dig a borewell. There is plenty of water here”, he said with confidence. That was reassuring. I checked on who were the owners of the adjoining lands. My guide was unaware of that. He basically didn’t know anything about the village or its villagers. He just knew how to take someone to the land that he had to sell. “What about that piece of land? Is that also part of the same parcel of land you are offering?” I asked out of curiosity. “No, sir! That belongs to someone else. They will also sell one day. Not right now!” he said. “Why is this land being sold? Doesn’t the farmer not want the land?” I asked out of curiosity, realizing that I was a stranger to this place trying to buy land. “What’s the name of this village?” I asked, suddenly realizing that I didn’t care to ask where this land belonged in. “Sir, we need to check the land records for that. The village names all keep changing every hundred meters.” He said as a matter of fact. “Don’t worry about the owner of the land. This is barren land that no villager has used since decades as it sits on rocky hilly terrain. The villagers think only a fool would buy such land”. I nodded my head in agreement. It again took a while for us to understand what just happened. “What I meant was they don’t appreciate the utility of converting barren land for agricultural use. You can bring technology and make it great. They don’t trust technology much. Sir, but, the locals are friendly. They are finally happy that people from cities are coming and trying to do something good for the rural areas.” he belabored his point. I smiled at him. I always wanted to test my hands at organic farming. I wanted to harvest vegetables and fruits on a land that I could call as my own. Using my own two hands, to till, plant seeds and to grow green life. I wished to eat healthy food that you could produce on your own, share the surplus with the village and do good for India, for humanity and for your ego. Such thoughts always crossed my mind. I could make it a reality. “So, can I grow vegetables on this land?”I asked my guide. “Why not? This is barren, dry land. You can grow anything on it, sir.” He said in a convincing tone. I was convinced. It was either his voice or the blazing heat of the open sun. It made me listen to him with keen attention. Back in the city, we tactfully avoid the sun, over here in the village, you just get baked. “This looks good. But I have to think further about buying the land. Why don’t we head back and I will let you know about my decision”, I said while picking a bottle of water from my car and quenching my thirst. Just then a person who looked like a villager passed by. The good thing about these villages along borders is that people talk in three tongues. I asked the villager in Telugu if water can be found if we dug a borewell on this land. He stopped his bicycle and parked it on its stand. My guide was also curious to know what the locals said so that he could adjust his facts for future clients. The villager asked me to repeat again. This time I tried in Tamil. He picked it up immediately. My Telugu didn’t work for him. My guide didn’t know Tamil though. He now turned to me for translation. “You see all the farms on all sides of this land? Do you see the Eucalyptus trees right next to your land? Do you think anyone would have left this acre of land idle if there was water to grow something?”, the villager asked with a serious look on his face. “Well, the huge mango farm seems to be doing just fine nearby. So, I thought maybe it will work?” I said with a sheepish look on my face. “That is on a slope. That slope ends just right here before the land. Even rains can’t help you.” He warned to my obvious discomfort. Even my guide picked the gist of what was happening. He tried to assure me. We thanked the villager and wished we never met him. My guide sat in the car. I smiled and said I was visiting the place just checking on things and didn’t go that far in negotiating a deal. The villager asked me to call him and I said yes and drove away. He didn’t give me his number. I didn’t take his nor gave mine. I wasn’t sure how we imagined calling each other. It didn’t matter. He didn’t look too eager to sell me anything. “What’s ahead of us if we keep going on this road? Does it lead us back to the main road?” I asked. “Who knows sir! We just have to try. Google maps doesn’t help here.” he said. I drove along hoping to avoid the horrible conditions we came through. We passed along a narrow-abandoned stretch of thatched houses that were made of mud walls. It looked like a small dwelling that once existed on the periphery of the main village. I wondered who lived there and why they left the place now! The villages here had varying shades of affluence and poverty. I wasn’t sure what I could achieve by being a stranger among them. I drove along as the car passed along a road that led to an Israeli mango research station. It was reassuring to see that there were initiatives in place to help some farmers. We soon caught the main highway and were on our way towards Bangalore. The journey seemed tiring now. I was eager to go back home. 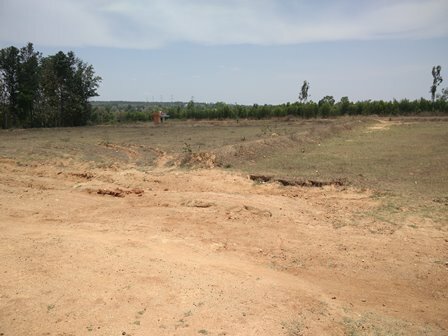 My guide pushed me to make a quick decision as apparently there were many buyers from Bangalore looking to buy land. They do farming, build farm houses or sometimes keep the land idle. I wasn’t sure where exactly I fit in. The heat of the pre-monsoon summer made me realize it wasn’t easy business growing crops. I decided to take my time. I was at least lucky enough to make such choices. For a farmer, there isn’t any.